Foresight is often applied when there is a perceived need for change. For instance, the change may be related to forthcoming budgetary changes which call for new strategic priorities. Alternatively, foresight may be initiated in the conditions of overwhelming inertia and observed difficulties to generate change to improve organizational performance or regional competitiveness, for instance. Wider societal and structural long-term changes are often referred to as transitions. System transitions are complex societal co-evolutionary processes that are typically led by gradual adaptation rather than visionary management or coordination. Still, visionary coordination of policies, regulation, corporate strategies and social learning may overcome some barriers and foster new innovation efforts providing sufficient impetus towards system transition. Predevelopment (incubation) with the diversity of experimentation activities. Take-off of the process of transition. Acceleration of the change process with the increasing returns of economies of scale that support the diffusion of new solutions and lead to structural change. Stabilization with the decreases in the speed of societal change. The transition is a complex multidimensional societal change process dealing with the co-evolution of technological, industrial, policy and social changes. 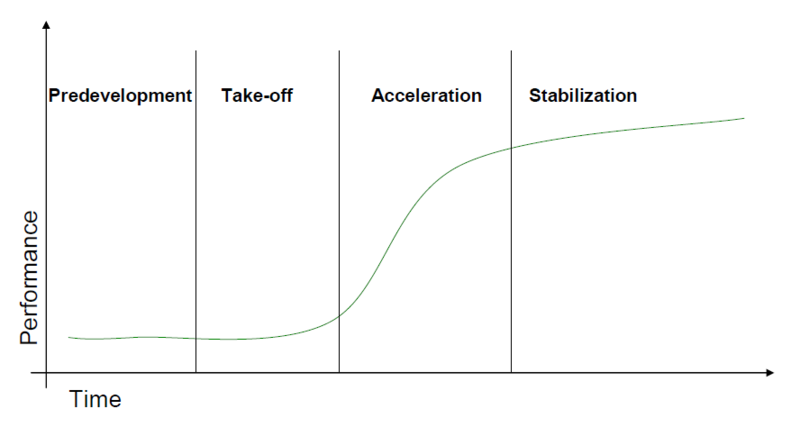 The S-curve is highly simplified illustration of such a process, developed to conceptualize the development and diffusion of an individual technology. Another key element of transition theorising is the parallel analysis of societal developments in different levels, including niche, regime and landscape level developments. The multi-level ‘niche-regime-landscape’ analysis doesn’t refer to multiple aggregation levels as such: the issues focused at each level are selected on the basis of their relevance to the specific system transition in hand. Specific attention is paid to the interconnections between these levels of analysis, focusing on issues relevant to the particular context in question. Landscape forms an exogenous macro level environment that influences developments in niches and regimes. Regime refers to the established mainstream techno-institutional policy, industrial and user system delivering a specific function in society. The regime is dynamically stable and not prescribed by external constraints but mainly shaped and maintained through the mutual adaptation and co-evolution of its actors and elements. Niche forms the level where radical novelties emerge that deviate from the existing regime. The above described four phases of transition, three levels of analysis and the four dimensions of the system transition are important elements in the analysis of system transition. In particular, when these elements are combined to a common framework it is possible to identify transition drivers and barriers in more detail. The combined approach supports the positioning of specific developments at one defined moment in time. However, this type of presentation is static leaving out time, which is crucial when evolutionary processes are dealt with. This framework needs to be adapted to the co-evolution of different technologies and systems that are likely to exist in parallel but in different phases of transition. Towards this end the transition phases can be replaced with the timeline that allows explicit analyses of the co-evolution of various transition phases within different dimensions and levels (Figure 2). Figure 2. 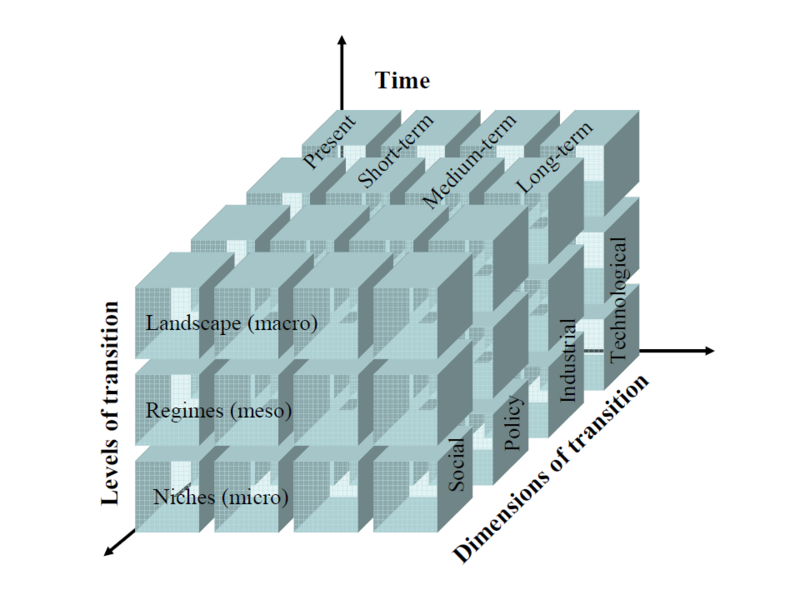 Time, levels and dimensions of transitions.